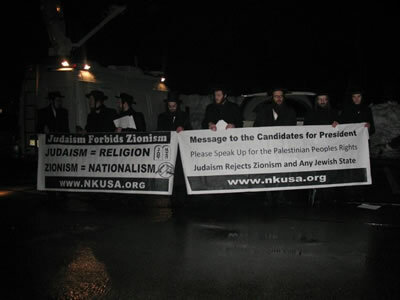 A group of Anti-Zionist Orthodox Jewish Rabbis will, with the help of the Almighty, tour several New Hampshire sites, where candidates are campaigning for the primaries, in order to deliver the following message. The time has come to step back and truthfully analyze the root cause of all this suffering, to Arab and Jew, alike. From ancient times, the relations between the Jewish and Arab peoples, have been those of peace, brotherhood and harmonic coexistence. Friendship reigned between them in all the Muslim countries. What has transpired to cause such a complete reversal, that mistrust and deep rooted animosity exists between these people? The answer is actually very clear and simple. The birth of a wholly new and entirely materialistic movement named "Zionism". 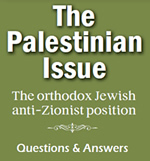 "Zionism" is the basis of the State of "Israel", and is not the same as the religion, Judaism. In fact it is antithetical to Judaism. 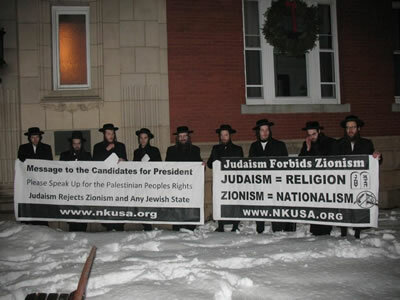 Zionism is a political movement, created almost entirely by non-religious Jews. Its existence is a mere hundred years. The philosophy of Zionism is the transformation of Judaism, from a religion and spirituality, to a base nationalism. It is a materialistic goal to have a land, army etc., removing the Almighty out of the equation. Orthodox Jews have opposed the ideology of Zionism since its inception and the State of â€œIsraelâ€� from the day of its ratification. The existence of the State of Israel is in direct contradiction to the teachings of the Torah which forbids the establishment of a Jewish state and commands Jews to remain in exile until released from that exile by the Almighty Himself, without any human intervention, at which time all nations of the world will live together in peace. This rebellion against the Almighty has been compounded immeasurably by the fact that in order to create this State, a land has been taken, clearly against the will of the indigenous population, the Palestinian people. Many have been murdered, their homes and properties have been confiscated and untold thousands have been expelled, etc., their suffering continues unabated until the present day. We decry, in the strongest of terms this ongoing crime and tragedy. The anti Zionist Jewish people sees itself as simply continuing the Jewish peopleâ€™s age old obligation of living humbly and in peace with all nations, in loyalty to their authorities, as is required by the Torah. 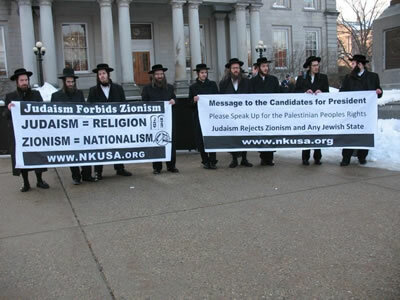 Rabbis, Orthodox Jewish leaders and laymen, have combated the concept of Zionism continuously since its inception and up until the present day. True Torah Jews will never accept Zionism and the State of â€˜Israelâ€™. Supporting the Palestinian people, does not make one, in any way, less of a friend of the Jewish people and most certainly does not label one an anti-Semite. How much more Arab and Jewish blood must be spilled? May we merit to see the day, soon in our times, when all humanity will serve the Almighty in brotherhood and harmony. AMEN.